It’s officially the season of summer reading. We asked peer-to-peer lending advocates Kristi Saare and Tauri Alas from Investeerimisraadio to reveal their favorites – books they simply loved and that made them think in new ways. Here are their top six recommendations. KRISTI SAARE is an English & economics teacher with a passion for investing. Her financial journey has lasted for 4 years and her investing portfolio consists of peer-to-peer lending, stocks and real estate. On Bondora she has invested from 2012. Together with Tauri she hosts a weekly investing podcast and founded Estonian Women’s Investment Club. She also blogs about her investing journey and on top encourages Estonians to be smart with their money. It’s rather difficult to achieve big things just working on your own. How to find the people who could potentially be a part of your team? How to make those important connections which might lead to good deals or open doors and give you access to awesome people and great projects? This book is obligatory for anyone who wants to know the secrets to networking successfully – something that becomes more and more important as you develop your investment portfolio. It’s a known fact that retail investors tend to do worse than more experienced investors with bigger portfolios. Quite often the reason for this is simple – beginners struggle to overcome irrational biases and make emotional decisions without taking the time to rationally consider all aspects of the situation. Any investor who has ever had to make any decisions will definitely recognize some of the mistakes they’ve made by reading this book, and can definitely make better decisions in the future after having taken a moment to consider whether or not they think clearly. To my surprise An Astronaut’s Guide to Life on Earth is in the definite top 3 of my most motivational books that I have ever read. 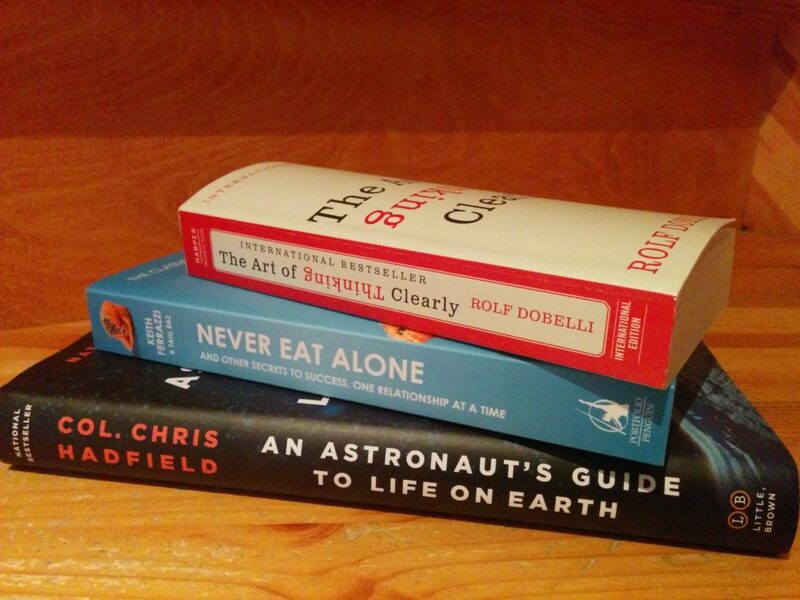 While I started the book since I find space fascinating the way Col Hadfield prepares how to prepare for things that might be impossible – as he prepared for becoming an astronaut at a time when Canadian astronauts simply did not exist – ended up being a highly motivational read. If you want to know how the power of negative thinking can help you and how to prepare for things in your life that you can’t really prepare for, and if you simply want a read that keeps you on the edge of your seat, this is the book for you. TAURI ALAS is a professional in the logistics industry and a true advocate of peer-to-peer lending. His investing portfolio consists exclusively only of peer-to-peer lending. On Bondora he has invested from 2012 and covers his portfolio health regularly in his investing blog. Together with Kristi he hosts a weekly investing podcast and also aims to boost Estonians to establish a regular investing habit. Elon Musk is probably the only man in this world who is crazy enough to build rockets for colonizing Mars with humans. He also thinks that electric cars should be the future of transportation and that true sustainable energy comes from the Sun. If you’d like to know how world changing companies like PayPal, SpaceX, Tesla and SolarCity got started, then this is definitely your mandatory reading. Peter Thiel co-founded PayPal with Elon Musk. Actually, it is more true to say that Musk’s X.com and Thiel’s PayPal were fiercely competing with each other until they decided to merge just a couple of years before the tech bubble bursted in 2002. Since then Thiel has been actively working with startups and shares his ideas in Zero to One. While most of us think that the key to startup investing is to have a well-diversified portfolio, Thiel thinks the opposite: if you want to win, you must set your focus on just a few startups. Are you the person who enjoys fulfilling your boss’s dreams of hardworking cheap labor? In that case the book „Rework“ is not for you. It’s an extremely easy read that emphasizes that we all are working in this new reality where we should avoid meetings, say no to workaholism and set our focus to important things that really matter. An excellent book for the summer – every chapter is one to two pages long and nobody can say they don’t have time to read. What books are in your power reading list? Share in comments.